Do you wonder why some people are not happy with their life even though they are rich and wealthy? The simple reason is they do not know what their values are. Money itself does not bring you any happiness. 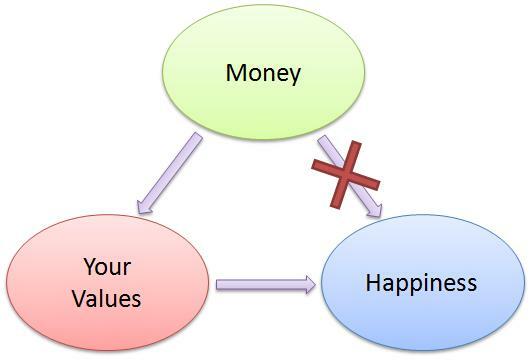 If you are only focusing only on making money, there is no real happiness at all. It makes no difference whether you have $1 million or $1 now if you do not know your values. Only people who work for their goals that are consistent with their values and focus their money on the things that are most meaningful to them will find true happiness. For example, people who value their family life will likely to spend more money on their family in term of expenses for regular gathering or holiday. By doing so, it will enhance the family relationship. People who value knowledge will spend more money on books or taking courses. By doing so, one can learn and understand more things. Your values are integral to your character, to your life’s purpose, to the way you create your future. 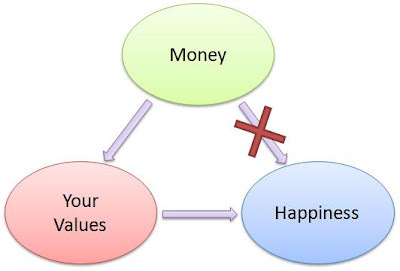 It is only when you know what your values are then you are able to make money decisions that are value-driven which will bring happiness to you. I've added your financial blogs to a list that i'm compiling on Singapore Investment Bloggers. Would be great if you can create a link back to the site as well. No problem, I will add yours in my investment blog.